Many creatives are fueled by obsession. Obsession with a subject. Obsession with a material. Obsession with a colour. Obsession with all of the above and much, much more. My main obsession lies in striving to create something that is RIGHT. What I make doesn’t have to be perfect, symmetrical, or anatomically correct (that would create pieces too sterile for my taste), but it does have to be skillfully executed. Above all, it needs to be what is necessary to make all the elements of a piece sing with synergy. The sculpture I’m currently working on – a clown character for a series inspired by the circus and sideshows – is providing me with plenty of new pattern making and construction challenges. And that, my friends, opens up tons of opportunity to obsess. A traditional signifier of clown-ness is Damn Big Shoes. I’m not in the habit of making shoes for my figures, so I did what I always do when I’m making an object for the very first time. I got on the mighty interwebs and did a bit of research to get me started. 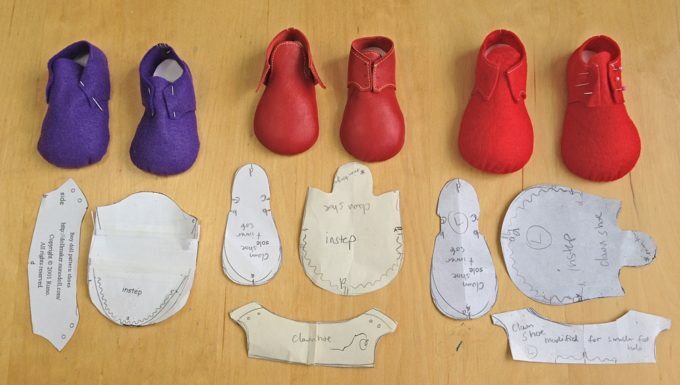 I quickly found several doll shoe patterns that shared basic pattern pieces and assembly instructions. I chose one that looked as though it was the correct scale (shout out to Runo, who provides excellent instructions and in my opinion is an expert doll-maker). 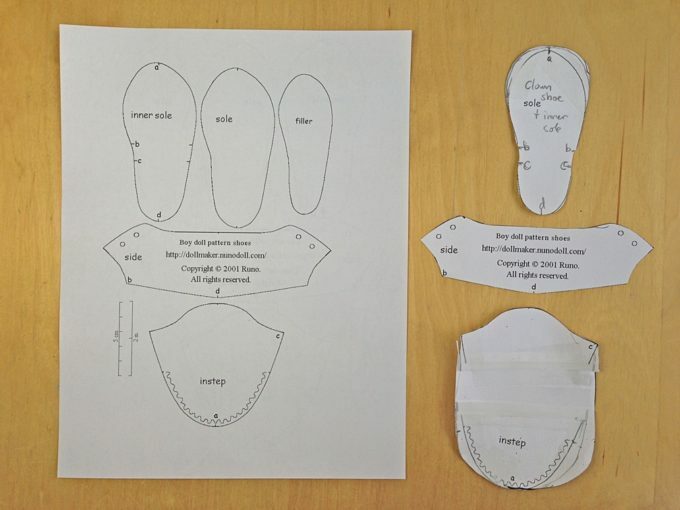 I printed out the original pattern and then started to re-draw the shape of the sole and the upper (labeled as “instep” in the photo) into the typical exaggerated round clown toe. 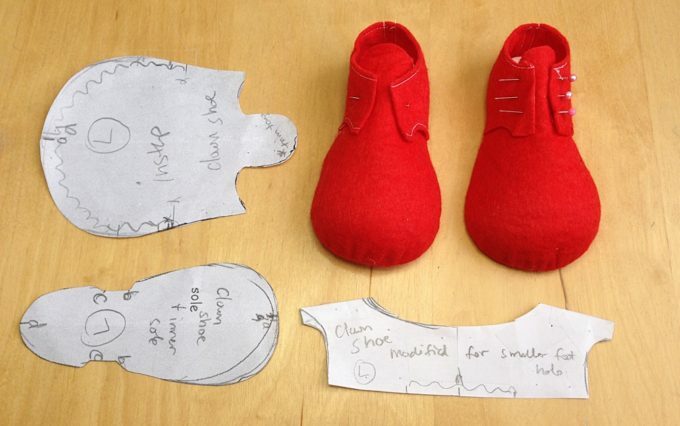 I tested the altered pattern by creating a mock-up of felt. 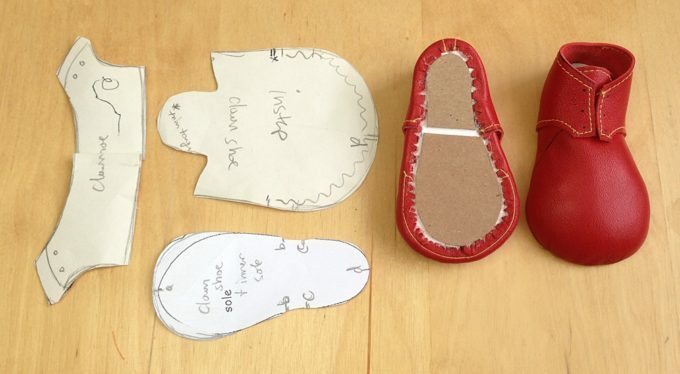 The test shoe prompted me to make adjustments: shaping the instep, altering the quarter (the piece that wraps around heel and sides) to achieve a narrower foot-hole, and slimming the bottom sides of the upper to create a snugger fit around the arch. I then created a second shoe with the updated pattern, this time in leather to see how it felt to work with the material that would be used for the final product. Further alterations were needed to the tongue and the vamp (the part where it laces up). At this point I decided the shoes were not quite living up to the clown-like proportions that I was ultimately after. Back to the drafting board to shift pattern shapes and make yet another test. I scanned my altered pattern pieces and printed them 20% bigger (doesn’t sound like much, but when you’re only 20” high it’s significant!). However, enlarging my pattern 20% meant that I was back to having a larger-than-wanted foot-hole. 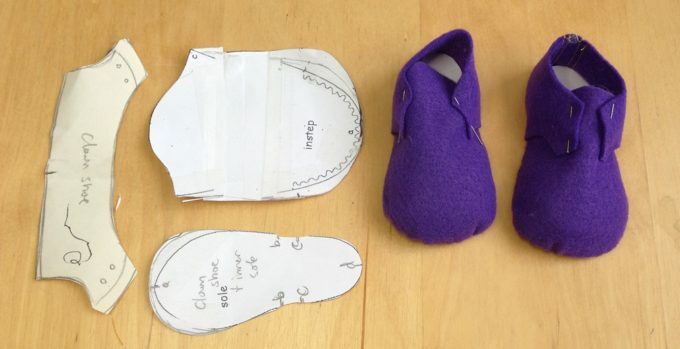 I altered the pattern again, diminishing the foot-hole, notching out the arch of the sole, and adding ease to round out the heel before making a sixth and final test out of felt. I’m satisfied with the latest mock-up on the right. As long as the current pattern translates well into leather there will be no more modifications. I’m now going through the same process with clown gloves. 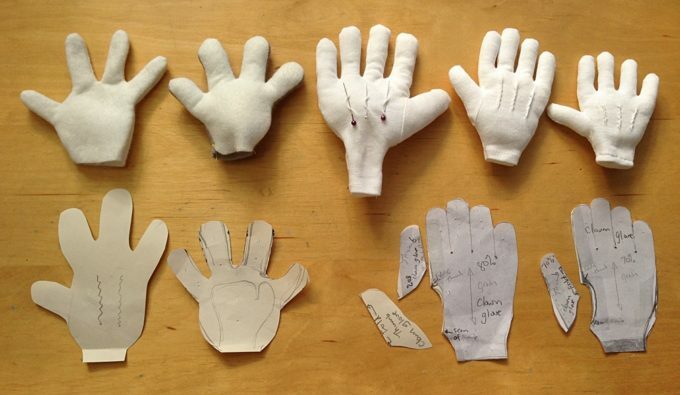 I started with cartoonish mock-ups and honed in on miniaturized versions of cotton archivist’s gloves. I’m getting close with the final version on the right. You can see I’ve already made alterations to the pattern below in anticipation of the next iteration. In the end my plan is to use two that are slightly different sizes. Asymmetry creates interest! All of this constant repetition and refinement takes time and effort. It may seem a bit tedious but it’s a mandatory part of my practice. Each time I repeat a process I find some way in which I can improve the outcome. When scale, pattern, colour and shape work together harmoniously to create an end product that is more than the sum of its parts all of the repetition proves to be worthwhile.